If you do a lot of kayak fishing, you know how frustrating it can be to find a tackle box that holds as much as you want, fits well in the kayak, and is still functional and usable once you are on the water. It certainly isn’t an easy task to do, but we have some suggestions for you for a great tackle box for kayak fishing. We have found that the key to getting the right tackle box for fishing from a kayak is actually to get a medium-sized to smallish-sized tackle bag that can hold several different trays. The reason is that it doesn’t take up a lot of space and you can bring three or four different trays with you depending on what you are targeting. You could, in theory, have 3 or 4 different trays each for different situations, and when you decide what you are going to target, you switch those out with the ones you have. It’s also highly functional to have a tackle bag waterproof trays on a kayak with you. Here is an overview of our list, starting with our choice for the best tackle box for kayak fishing. First on our list is this fancy Wild River Lighted Tackle Bag, a fantastic choice for bringing on the water with you. It’s a small tackle bag that measures 8 inches by 13 inches by 6 inches, so it won’t hold everything but the kitchen sink. However, kayak fisherman must be a little more selective when space runs low, and this bag is the solution. It holds five trays of tackle, which should be plenty for most types of fishing. This tackle bag isn’t huge but it sure packs a punch! If you are the kind of person who doesn’t need a lot of lures, the extras on this tackle bag sure make it a tempting purchase. It won’t take up much space, either! The SpiderWire Wolf tackle bag is another great candidate for kayak fisherman. It’s a fairly good sized bag, measuring 15 inches by 8 inches by 12.5 inches. It will hold a decent amount of tackle in the four storage trays that it comes with, and it has plenty of pockets on top of that. Here are a few key points on the SpiderWire Wolf tackle bag. As you can see, this tackle bag is a basic tackle bag that will hold just about everything you need for fishing on your kayak, and it won’t take up a lot of space either. This medium tackle bag should be perfect for kayak fishing since it won’t take up a lot of space, but still has enough trays to hold a good amount of tackle. FISH AT ALL HOURS: This lighted fishing tackle backpack features an integrated LED light system so you can fish any time of day. PROTECT YOUR GLASSES: This fishing tackle backpack has a mounted molded sunglass holder to help keep your glasses safe. REMOVABLE PLIER HOLDER: This fishing tackle backpack has a removable plier holder so your pliers go from bag to belt and are easy to find. PROTECTION FROM THE ELEMENTS: This fishing backpack features a protective rain cover that can be quickly deployed to keep your tackle backpack contents safe. CONVENIENT WORK SURFACE: The front pocket cover on this fishing tackle backpack folds down to provide a handy work surface. 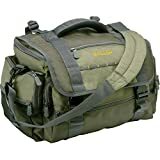 This may be the only tackle bag purchase you’ll have to make for the rest of your life, as many people report it being very durable. It also has all the bells and whistles, helping you fish 24 hours a day. If you have the space for it on your kayak, this tackle bag is a great investment. Dimensions: 17" x 10.5" x 11"
This tackle bag is a medium sized tackle bag that will hold plenty of tackle and will fit well on your kayak. Definitely one of the best tackles boxes for kayak fishing! Any of the above tackle boxes will work well for your kayak fishing experience, so you should try to figure out roughly what dimensions would work best for you and go with something similar. All of the tackle boxes are built for convenient carrying and handling, and can make your fishing experience even better! Take your pick, and thanks for reading about a tackle box for kayak fishing. Looking for a great tackle backpack? Click here!